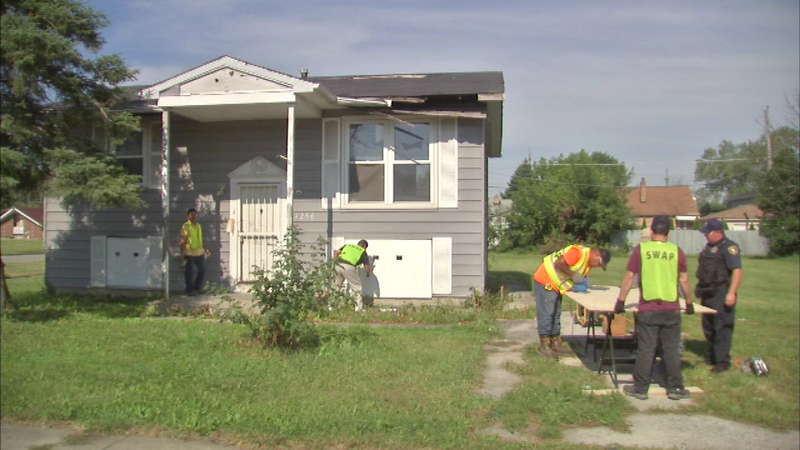 Non-violent offenders are boarding up buildings in suburban Dixmoor as part of a Cook County Sheriff's Department program. DIXMOOR, Ill. (WLS) -- Non-violent misdemeanor and traffic offenders are boarding up and tearing down abandoned buildings in the south suburbs as part of a new Cook County Sheriff's Department program. The plan is called Sheriff's Work Alternative Program, or SWAP, and is being tested in Dixmoor. The goal is to get rid of abandoned buildings, which can sometimes be a home for crime in neighborhoods. The buildings are in communities that would not otherwise have the resources to address the problem, said Cook County Sheriff Tom Dart. Dart is hoping to expand the program to get rid of abandoned buildings and to keep more people out of the over-crowded county jail.